Dr. Gladys Kalema-Zikusoka never expected to be so deeply involved in family planning when she started Conservation Through Public Health (CTPH) 10 years ago. CTPH began with a simple mission: to help preserve endangered mountain gorillas in Virunga National Park in the Democratic Republic of the Congo, and Bwindi Impenetrable National Park in Uganda. But, as Kalema-Zikusoka explains in this week’s podcast, they quickly found that to help the gorillas, they had to help the people living around them. CTPH’s initial goal was preventing cross-species cases of scabies and tuberculosis, which at the time were affecting both human and mountain gorilla populations. Gorillas, whose historical ranges stretch beyond the confines of the parks, were entering the land of farmers living on the edges and eating their crops, resulting in cross-infection from shared contact and sometimes-violent responses from villagers. CTPH formed “village health and conservation teams” (VHCT) to promote improved sanitation and treat disease in the human communities to help prevent these cross-species vectors. They also created response teams trained to peacefully deal with gorilla incursions. But the community health teams in particular opened up a new world for CTPH. Kalema-Zikusoka notes that a USAID officer at the time said, “We have money for family planning, but we don’t have money for zoonosis.” She says her initial thought was, “No, family planning that’s not what we’re doing, how could we be distributing condoms to people around the national park?” But after taking note of how many impoverished families in the region were stretched thin by having more children than they could handle, Kalema-Zikusoka says they saw how meeting existing demand for family planning could advance their conservation goals by creating healthier families. VHCT began distributing contraceptives and easy-to-understand narratives about families with fewer children that are all able to go to school, families with many children with only some going to school, and the different life outcomes of the children as a result, she says. Expanding CTPH’s programming beyond conservation to health led to other poverty-reduction efforts. “The [VHCT] volunteers came to us and said, ‘Can you give us goats, and can you give us cows? …We want to sustain ourselves,’” Kalema-Zikusoka says. “So we gave them group goats and group cows, and they went ahead and developed their own income-generating projects.” They also brought internet access to the area via a new telecenter. 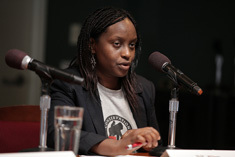 Kalema-Zikusoka spoke at the Wilson Center on September 26. Download her slides to follow along.